Q: What type of extensions are they, and how are they put in? A: The method is called "cold Fusion" which are tiny micro beads that are looped through a tool with your natural hair, then clamped together. A: Be prepared to spend most of the day at the salon. It can take upto 8 hours for a full head. A: If you decide to keep them, you will need to have them moved up and some replaced in 2-3 months. Q: Can you reuse any strands that fell out? A: Yes, if the tip of the strand is not blown open then it can be reused. Q: Is it real hair? Q: Can you bleach it? A: NO! 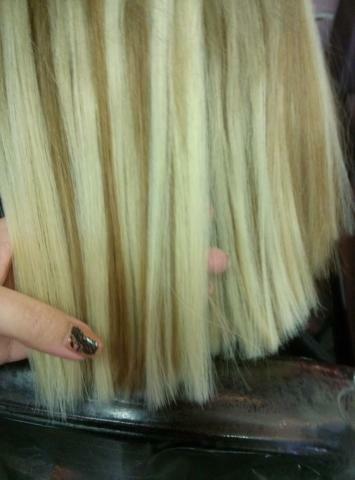 These extensions have been treated and color processed to the max. Bleaching it will dry it out and cause breakage and possibly ruin them completely. Because these strands are no longer connected to the scalp they lack natural oils and nutrients, therefor cannot repair it's self. Q: Can you color them? A: Yes as long as you use a extremely low volume peroxide or peroxide free. It is recommended that you not color them often, coloring can do some damage. Q: Can I curl or flat iron them? A: Every salon has different pricing. Good quality hair and application can range anywhere between $600-$1,200. I would question anything priced less then that. This is a very time consuming and expensive process that is worth every penny! Hair Extensions is considered a luxury service, maintenance and upkeep are involved. Q: If I don't like them can they be removed? A: After 2 weeks from initial application There is no charge to remove them. After the 2 week grace period there will be a charge ranging from $25-$50 depending on how much hair needs to be removed. Note: Price may fluctuate due to cost of hair.